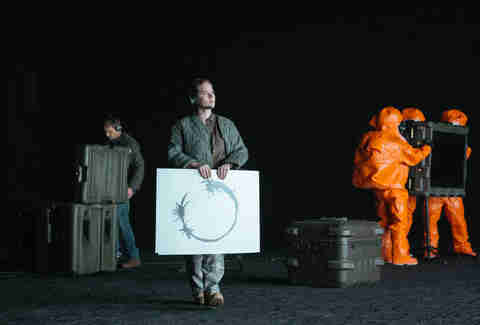 This post contains spoilers for the new movie Arrival. Inventing an entire language could take a century. Inventing an extraterrestrial language? 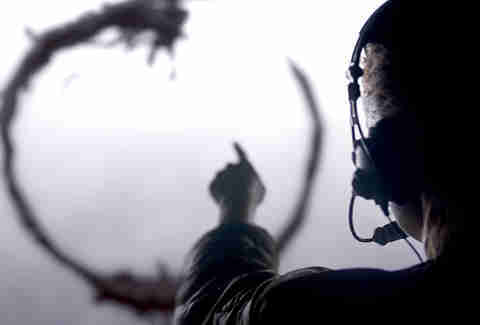 That's something production designer Patrice Vermette had to conceive, and in a short amount of time, for the new alien "invasion" movie Arrival. In the movie, spacecrafts touch down at key points across the Earth, leaving international governments mystified. 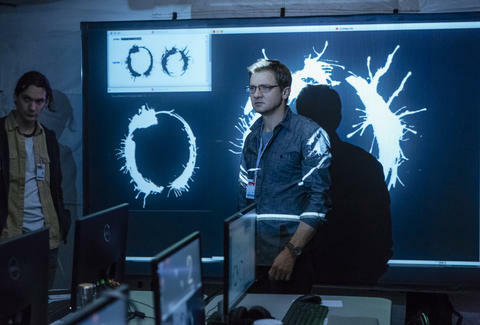 Amy Adams stars as Louise Banks, a linguist sent inside one of the crafts to interpret the visitors' words, a set of mysterious inky and circular "logograms" that the tentacled creatures can expel onto a frosty glass wall. Jeremy Renner co-stars as another scientist, who gawks like we do at the cryptic, jaw-dropping experience. The logograms had to feel real, but foreign. Intelligible, but cryptic. Exceedingly intelligent, but basic enough for us humans to crack. Coming up with exactly what those logograms were challenged Vermette, to say the least. "I did my own research with anthropologists and linguists, and we looked at extinct languages that had existed in the Middle East and South America, in North America and in Asia," says Vermette. "But Denis [Villeneuve, director] wanted something very inhuman, and the script suggested something circular because a story point is about non-linear time." Vermette hired graphic designers and linguists to devise and pitch different options. "I was quite unsatisfied because they were always very human-like -- people have a logic that a language should be a certain way." The logograms finally took shape when Vermette's wife, Martine Bertrand, a painter and artist in Montreal, threw herself in contention for the job. "She said to me, 'Can I have a go at this? I've been hearing you for weeks about that language,'" relates Vermette. "So I said, 'Yeah, sure, have a go.' And the next day I went to work, and at night I came back and on the dining table there was 15 different logograms." They resonated immediately with the production designer, and the director too. "This is it, this is it!" Vermette reports Villeneuve said upon seeing them. Even then, that was only the beginning. What followed was some "reverse-engineering" to produce a cursive language that had different inkblot-like shapes and built-in animation depending on the desired word. "We decided it could be thicker, say, when you are talking louder or lower, or when you write faster," notes Vermette. Later in the movie, Adams' Louise discovers that the symbols can be divided into 12 segments, with each logogram mixed and matched from various graphical elements to create complex words and phrases. It was a deliberate design conceit that, again, highlighted the non-linear story point. "We actually started from there," says Vermette, "and then began isolating the parts of the original 15 logograms that we liked. We created words, associating words, plots, or ideas to each of those inkblots. After that we created a dictionary with those inkblots, and we started assembling them according to what we wanted the logogram to mean." 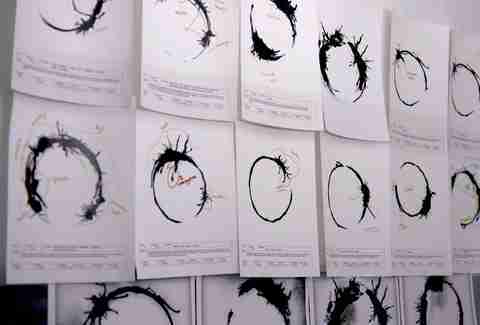 Over 100 logograms would ultimately be created, with 71 complete ones used in the film. The final look initially resembled ink in water, but Vermette thought that was "a bit obvious." Instead, he says, it was a combination of inkblots and, believe it or not, flies. "I saw flies over a lake and I did some research, and there's lots of flies over Lake Victoria in Africa. I liked the way the movement of those flies occurred, so I gave those videos to the visual-effects team, and that's how they made the final logograms." Ian Failes writes about visual effects and animation. Follow him @vfxblog.